The OPE-Li3 Battery Management System (BMS) is a dual channel system (separate charge & load channels) especially optimized for marine house banks. It is the world’s first plug & play, fully protected, dual-channel BMS. 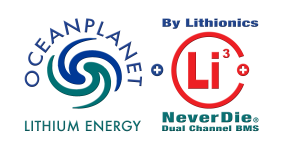 Developed by Bruce Schwab (renowned solo ocean racer, lithium battery expert, and America’s first Vendee Globe finisher) together with Lithionics, the OPE-Li3 is the safest lithium battery system available anywhere. 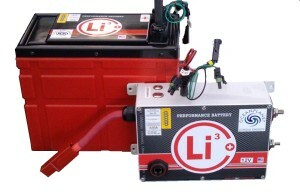 Lithionics is a leading manufacturer of lithium batteries and has an unmatched track record for safety and reliability. For many marine electrical propulsion, RV, & home applications, it may not be necessary to have the full protection of the OPE-Li3 Dual Channel BMS. In some cases we would recommend a Lithionics system with an Internal NeverDie Single-Channel BMS. See the Lithionics Internal NeverDie BMS Pricelist for sizes & prices. Contact us to find out the best battery system for your application. Due to a surge in Genasun’s solar charge controller business, Genasun is moving away from manufacturing batteries. Genasun and OceanPlanet Energy are here to support you with your existing system. Contact us for any help with your existing Genasun GLi system. If you are looking for a new lithium house bank, see our OPE-Li3 page. 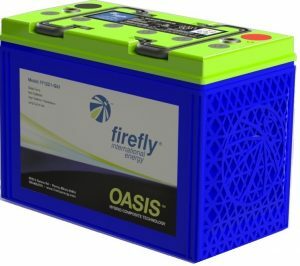 Firefly Energy manufactures the one of a kind Oasis Group 31 deep cycle battery with Microcell carbon foam technology. Oasis’ carbon foam design resists sulfation and corrosion (2 of the primary causes of failure in lead-acid batteries), while dramatically increasing the surface area within the battery, resulting in greater energy capacity, faster recharges, and deeper discharge capabilities. These batteries are low current/ high capacity which are perfect for smaller boats that have low 12V or 24V loads and need less than 100Ah capacity. They are extremely lightweight and have internal cell balancing for ease of installation and maintenance. Contact us for an energy system analysis and proposal.